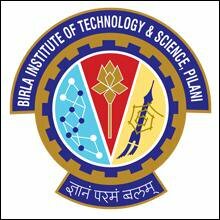 BITSAT 2019 - BITS Pilani will conduct Birla Institute of Technology and Science Admission Test (BITSAT) 2019 from May 16 to May 26, 2019. BITSAT is conducted in two slots on the exam day. The first session of the BITSAT exam will be held from 9 am to 12 noon while the second slot of the entrance exam will be from 2 pm to 5 pm. The online BITSAT application form 2019 has been released on January 4, 2019. Candidates can download BITSAT admit card 2019 from April 12 onwards. Candidates are informed that BITS Pilani has released the exam dates of BITSAT 2019 on the official website. Conducted annually, BITSAT is an online computer based test (CBT) that is held to shortlist aspirants for admission at BITS campuses located at Pilani, Goa and Hyderabad. BITS offers admission to interested candidates in its Integrated First-degree programmes including BE, Pharma and MSc programmes. BITSAT is a three-hour long exam comprising of 150 multiple choice questions (MCQs). Each section of BITSAT exam has questions from subjects such as - Physics, Chemistry, Mathematics, English Proficiency and Logical Reasoning. Check out the BITSAT 2019 exam pattern. More than three lakh students take BITSAT every year for admission to the programmes offered by BITS Pilani and its campuses. Why Should One Appear for BITSAT 2019? Aspirants can select their own preferred course combinations at BITS campuses. All BITS colleges have good infrastructure, faculty and industry exposure. Toppers of State Boards are offered direct admission. BITS offers good placement opportunities to aspirants. Apart from this, candidates who are not able to secure a good rank JEE Main can opt to pursue an engineering degree at a renowned college in India by clearing BITSAT 2019. Admit card: This is a mandatory document. Without BITSAT 2019 admit card, aspirants will not be allowed to appear for the exam. Photo: Candidates will also have to carry one passport size photograph to the BITSAT test centre. Photo ID: Any one of the authorized photo IDs (must be original, valid and non-expired) too is required. This can be your PAN card/ Driving License/ Voter ID/ Passport/ Aadhaar Card (With photograph)/ Aadhaar Enrolment No/ Ration Card. Do not carry any text material (printed or written) except the BITSAT 2019 e-admit card inside the test centre. Candidates will not be allowed to carry any electronic devices like mobile phones, paging devices, calculators, spy cameras and music systems. Before filling BITSAT application form 2019, candidates should ensure that they fulfil the eligibility requirements for the exam. One of the basic eligibility criteria to appear for BITSAT is that candidate’s must have passed Class 12th examination of 10+2 system from a recognized Central or State board or its equivalent with Physics, Chemistry, and Mathematics and adequate proficiency in English. 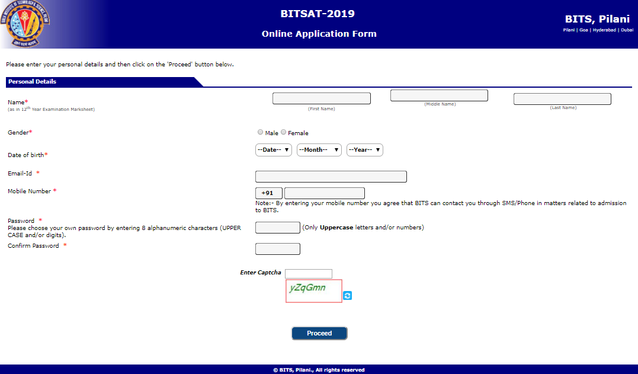 How to fill BITSAT 2019 application form? Interested candidates need to apply for BITSAT through an online form, available on the official website of BITS Pilani. In order to register for BITSAT exam, candidates need to register on the official website by providing the below mentioned details. After filling the details, click on the ' Proceed' button. In the BITSAT 2019 application form, candidates need to fill their personal and academic details along with specifying their preferred programme and marks obtained in the qualifying examination. Candidates need to keep scanned images of their Photograph as well as Signature handy while filling their BITSAT application form 2019. The photograph and signature need to be in the below-mentioned dimensions and format. Besides the above, candidates also need the following documents to fill the application form successfully. - An attested photocopy of the Class X pass/ Matriculation/Secondary School certificate issued by the Board. - An attested photocopy of the mark-sheet of the qualifying examination and any other higher University/Board examinations passed. By cash payment at all ICICI Bank branches in India along with a specially generated Pay-in-Slip: Applicants can choose to pay through Cash at ICICI Bank branches. For that, they have to download the specially designed Pay-in-slip from the website on the payments page and walk-into any ICICI bank branch along with cash. The bank shall deposit cash and give you a confirmation receipt for the same. An attested photocopy of the Class X pass/ Matriculation/Secondary School certificate issued by the Board. An attested photocopy of the mark-sheet of the qualifying examination and any other higher University/Board examinations passed. The BITSAT registration form sent by Fax or Email is not accepted. Candidates are also advised to note down their application form number because this is a unique number issued to them and which can used by them for all subsequent correspondence with the Institute. Candidates, who are interested in applying for admission to BE (Hons) programmes as well as ME/MBA programmes on offer at BITS Pilani, Dubai Campus, have to download a copy of the admission form for BITSAT and find out all the necessary information from the official website of BITS Pilani, Dubai. BITS Pilani will open the window for BITSAT application correction for students who have filled in wrong/incorrect information. This facility will enable candidates to make changes to their application form. For this, candidates will need their BITSAT application form number. Please note that no more changes can be made in the application form after this. Q. When will BITSAT 2019 be held? A. BITSAT 2019 will tentatively be held from May 16 to May 26, 2019. Q. When will BITS release BITSAT 2019 application forms? A. The online application form BITSAT was released on January 4, 2019. Q. When will the admit card of BITSAT 2019 be released? A. The admit card of the BITSAT will be released on April 12 and candidates can download it till May 13, 2019. Q. I have taken Physics, Chemistry and Biology in 10+2. Am I eligible to apply for BITSAT? A. Aspirants with Physics, Chemistry and Biology in 10+2 can write BITSAT 2019. However, they will be eligible to apply only for the BPharm program. They will not be eligible for any other first degree program of the Institute. Q. I have made a mistake in my BITSAT 2019 application form. How can I edit/correct it? A. The link to edit BITSAT application form will be made available on the BITSAT official website in March 2019 and candidates can edit required fields during this period. No email queries will be entertained in this regard. Subjects: Candidates must have PCM subjects (PCB subjects for B.Pharma) with adequate proficiency in English. However, students with PCM subjects can also apply for pharmacy. BITSAT exam pattern is such that the test paper comprises of questions of Class 11 and Class 12 level as found in NCERT books. Thus, candidates are advised to thoroughly go through Class 11 and Class 12 NCERT books for BITSAT exam prep. Also, BITSAT mock tests are issued to candidates who have successfully registered for this engineering entrance exam. BITSAT sample test/ mock test is usually issued in the month of March/ April every year. The test is given to the candidates to judge their power of reasoning spread in verbal and nonverbal areas. The candidates should be able to think logically so that they perceive the data accurately, understand the relationships correctly, figure out the missing numbers or words, and to apply rules to new and different contexts. These indicators are measured through performance on such tasks as detecting missing links, following directions, classifying words, establishing sequences, and completing analogies. BITSAT 2019 exam paper will be based on objective-type multiple choice questions where candidates will be evaluated on the basis of how many answers they give correct. It will be a three hour duration computer based online engineering entrance exam which will be divided into four sections/parts. Each section will have questions from different subjects such as Physics, Chemistry, English Proficiency and Logical Reasoning as well as Mathematics. BITSAT question paper will consist of questions in the above mentioned subjects taught to students as part of their Class XII syllabus. A total of 150 questions wherein candidates have to select the correct answer from four options. For every correct answer candidates will be awarded three marks. This engineering entrance exam will be divided into four sections. BITSAT 2019 syllabus lists the topics in which aptitude of candidates will be tested. View the detailed syllabus for BITSAT 2019 here. There is no section-wise time limit as per the BITSAT 2019 exam pattern. However, candidates have to complete their entrance exam in three hours duration. Thus, candidates are given the freedom to attempt any question/section as per their preference and are even given the option to go back to a question previously attempted by them and edit it within BITSAT exam stipulated time duration of three hours. Additional Questions in BITSAT: Also, if any candidate is able to attempt all 150 question of this entrance exam within three hours then he/she will be given an opportunity to attempt additional 12 questions within those three hours. These additional questions are such that four questions each will be asked from Physics, Chemistry and Mathematics sections only. However, any candidate who choose to answer these extra 12 exam questions are not allowed to go back to the original BITSAT exam and make any changes in the 150 answers he/she answered previously. BITSAT question paper has all the questions in English language only. Candidates who appear for this engineering entrance exam will be given different question papers and these exam papers will randomly be selected from a large database of exam papers by the computer. BITSAT exam pattern 2019 is such that the question paper comprises of objective-type multiple choice questions. BITSAT 2019 is a three hours duration computer based online engineering entrance exam. In BISTAT exam pattern the question paper is divided into four sections/ parts. Each section of BITSAT exam has questions from different subjects such as Physics, Chemistry, English Proficiency and Logical Reasoning as well as Mathematics. BITSAT question paper consists of questions from the above mentioned subjects that are taught to students as part of their Class XI Class XII syllabus. The medium of instruction of BITSAT question paper is English language only. Candidates who appear for this engineering entrance exam are given different question papers and these exam papers are randomly selected from a large database of exam papers by the computer. BITSAT exam question paper comprises of 150 questions. This engineering entrance exam is divided into four sections. BITSAT syllabus 2019 lists the topics in which aptitude of candidates is tested. There is no section-wise time limit as per the BITSAT 2019 exam pattern. However, candidates have to complete their entrance exam in three hours duration. Candidates have the freedom to attempt any question/ section in BITSAT 2019 as per their preference and are even given the option to go back to a question previously attempted by them and edit it within the stipulated time duration of three hours. The exam is of 3 hours duration. BITSAT is a computer based test. The exam comprises of objective type multiple choice questions. Each question comprises of four options and only one answer is correct. Candidates can change their answer for a question at any given point. There is negative marking in BITSAT exam. There is no time limit on when a candidate should complete each section of the exam. Questions in BITSAT paper are selected randomly from a large question bank and so each candidate receives a different set of questions. Candidates who complete 150 questions in the 3 hours duration get a chance to solve 12 extra questions. On completion of the exam, aspirants are provided with their BITSAT score immediately. Candidates can download and take a print of their BITSAT scores from the official website of the exam on the next day of giving the exam. If any candidate is able to attempt all 150 questions of this entrance exam within three hours then he/ she is given an opportunity to attempt additional 12 questions within the assigned three hours duration. These additional questions are such that four questions each are asked from Physics, Chemistry and Mathematics sections only. However, any candidate who chooses to answer these extra 12 exam questions is not allowed to go back to the original BITSAT exam and make any changes in the original 150 answers he/she has previously selected.